In case there was any question of my coolness, let’s just put that notion to rest: I am currently playing summer book bingo. But look how awesome that card is!! As you may or may not know, I am in the midst of an epic reading project. I am reading three books set in each of the 50 US states, plus the District of Columbia, and because diversity of authors and characters is central to the project, my reading this year has expanded into subjects and genres and neighborhoods that I might have otherwise overlooked. So when I heard Ann Kingman and Michael Kindness talk on their Books On the Nightstand (BOTNS) podcast about how they want to make summer reading fun this year – by designing Beach Blanket Book Bingo card and aiming for a Bingo by Labor Day – I was ALL. OVER. IT. I mean, look at those options! “Currently on the bestseller list,” “that ‘everyone’ but you has read,” “published in 2014.” That last is one I’m particularly excited about. I almost never read brand new books. The wait list at the library is always too long. But the next book I plan to read for Delaware, The Book of Unknown Americans by Cristina Henríquez, was published in 2014 and, get this, I am first on the wait list! It’s killing me to abstain from marking that box with a big blue X. I want to mark it SO BAD. I know I have to wait till I’ve finished the book, though, and I’m just thinking about how good it’s going to feel to squeak my highlighter across that square. Some folks are attacking their Bingo card with a strategy: they plan to read titles tailored to a specific row on the Bingo card. In the spirit of Bingo as it is played in Bingo halls around the nation, I’m taking a more randomized approach. I’m going to carry on with my reading as I had planned, state by state, Connecticut to Delaware to the District of Columbia, each book a ping pong ball with a BOTNS category stamped on it, and see if I can manage a Bingo before Labor Day. Maybe I can even score a Blackout Bingo – maybe I can fill the whole card. Do you want to play? Go to BOTNS Bingo! to print out your card; be sure to hit your refresh button to get a fresh card. 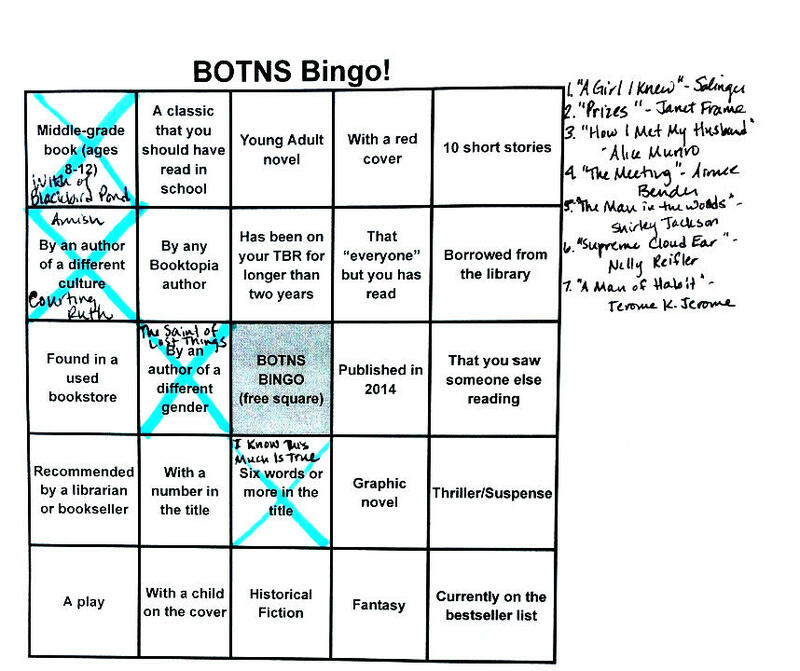 Then read your books, start marking your boxes, and if you want to follow along with other Book Bingo players, check out the BOTNS Bingo thread on Goodreads. I love this challenge so much, it still gives you room for choices! If I wasn’t doing my 20 Books of Summer already I would do this one! Good luck and enjoy! You could totally still do this – the quickest Bingo is four corners. I’ll bet you could get a bingo with your 20 books. It would be fun to see how they play out on these bingo cards. Now that is tempting, I’m going to have a look later! Happy reading! Great goal. Maybe one to add to my bucket list. I’m going to check out the BOTNS list next. Do it! You won’t be sorry. Love this idea! Just printed my card! Now I just have to decide what to read after I finish the book I’m reading now. We can compare cards when I come down to visit!